Breads and Beyond Bakery is located in the Ukrainian village in heart of Parma, Ohio and serves Parma and all the surrounding areas including, Independence, Parma Heights, North Royalton, and Southern Cleveland (Brooklyn). We have been in business for over 24 years. As a full service retail bakery, we offer fresh baked items daily such as nut rolls, cakes, pastries, pizzas and bread. We also offer custom cakes for all occasions. Owned and operated by Robert “Bob” Uhlir and Larry Louis. Together they have over 60 years of baking experience. Bob is a graduate of the Culinary Institute of America. After college he worked as a pastry chef for the Stouffer’s Inn on the Square Hotel (now the Renaissance Cleveland Hotel) in downtown Cleveland. His first passion has always been baking and satisfying his customers. He always strives to use the freshest ingredients. Larry Louis provides an abundance of experience with savory baking as well as many years of restaurant experience. Bob and Larry have known each other for over 20 years. They are both graduates of Brecksville High School (Bob – class of ’78 and Larry – class of ’83) and are proud to be serving their community. 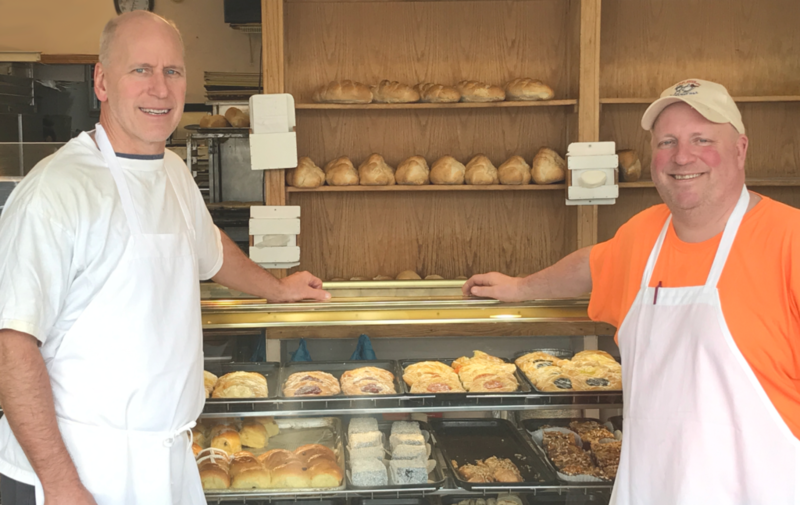 No one will work harder than Bob and Larry, to provide you with the freshest baked pastries and cakes.